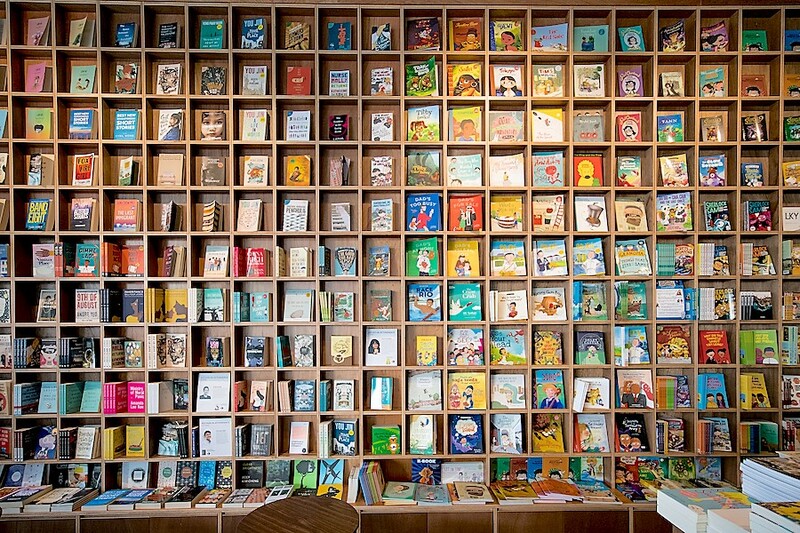 Or can you name a book published by a Singapore author? Singapore’s largest independent publisher, Epigram Books has opened a 980 square feet brick-and-mortar bookstore right at URA Centre, with 90% of the books on display written by Singaporean authors, published locally or all about Singapore. 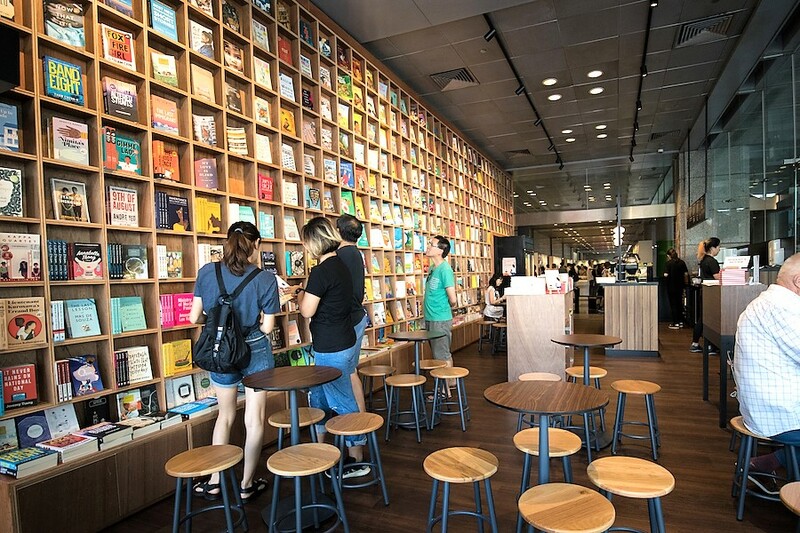 Their slogan “Hold Singapore In Your Hands” supports the notion of picking up a book alongside a cup of local-styled coffee. This is a major step forward in the local literature scene and a place to showcase local talents (more than just Russell Lee known for his True Singapore Ghost Stories). Over here, you can see many uniquely Singapore’s titles such as “Let’s Give It Up for Gimme Lao!”, “The Good, the Bad and the PSLE” and “9th of August”. 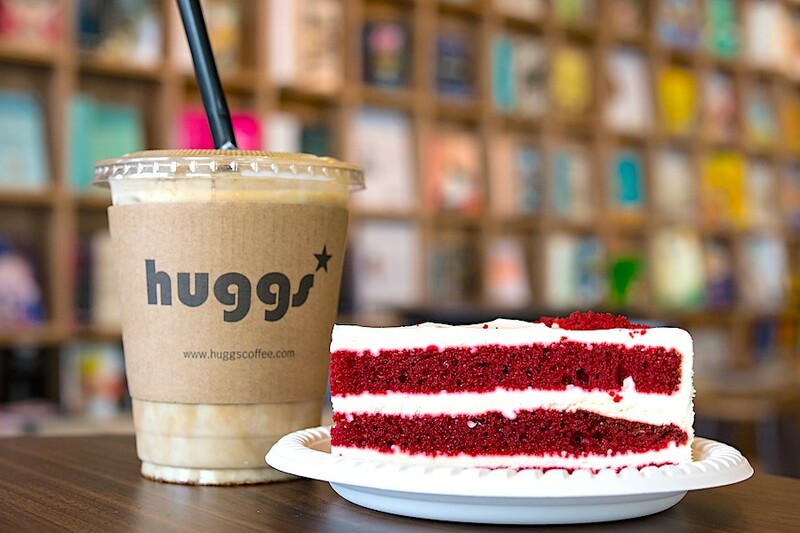 As I sit down and enjoy my cup of caffeine from Huggs Coffee in the 40-seaters space, the most eye-catching and alluring part of this place is the 11-metres long bookshelf. This spans all the way from the ceiling to the floor, housing 11 rows and 38 columns – which means more than 400 titles. Don’t worry about the books falling from the top rows even though they are really placed quite high up above the ground (because that’s one of the concerns from my neighbouring table). The aesthetically-presented bookshelf is easy to spot from a distance, especially when the walls are made of glass with ample natural sunlight shining through. 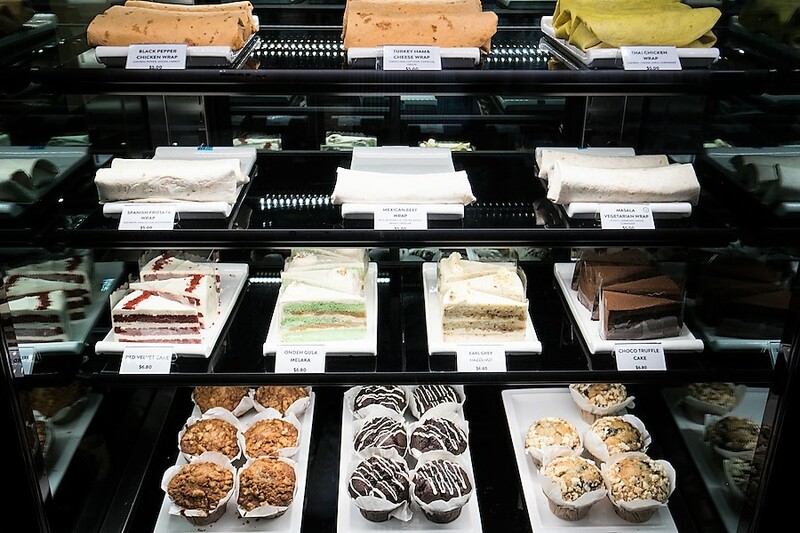 Cue the Instagrammers, who may love this place for a different reason. Something different from other bookstores is that there will be an Author-in-Attendance almost everyday in the bookstore. 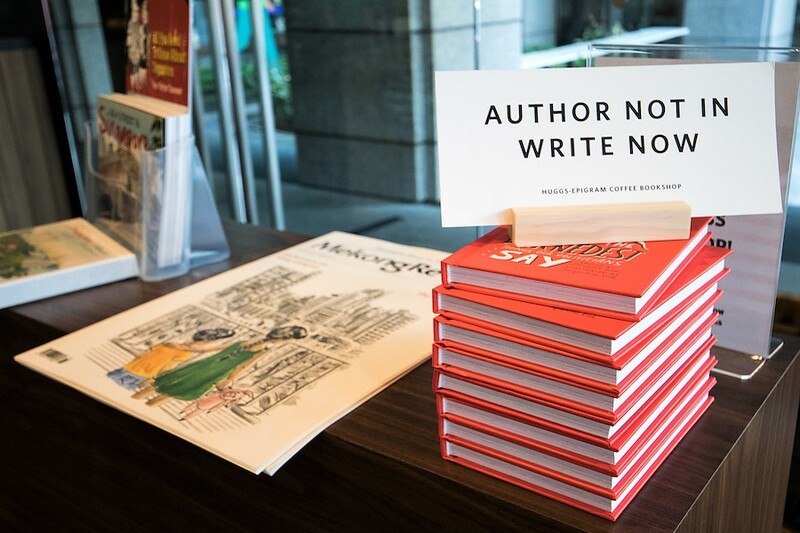 This is specially arranged such that the local author can share inspirations behind the writing, and you may be able to get a signature on the spot too. 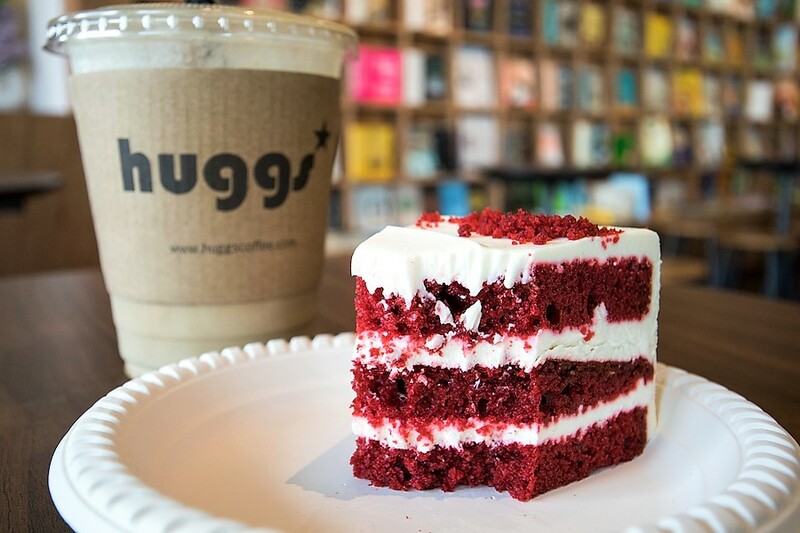 In collaboration with Huggs Coffee to provide a space for quick bite and drinks while books browsing, there are interesting local items on the menu. 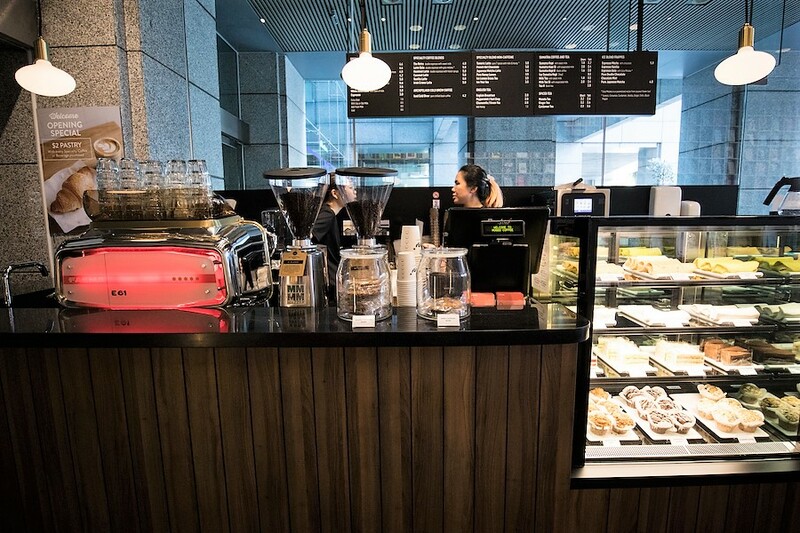 This includes beverages of Tumeric Latte ($5), Latte Gula ($5), Sumatra Kopi/ Kopi Si/ Kopi O ($1.80/ $2/ $1.60), Milk Teh Si ($2) and Masala Tea ($2.20). I had the Latte Gula ($5) with double shots of espresso and gula melaka which is quite unique with coconut taste in it derived from palm sugar. A refreshing treat on a hot day. Even though the Red Velvet Cake ($6.80) might seem artificial with that shade of red, it was surprisingly soft and moist, with moist layers of cream cheese frosting in between that added some creaminess. It is heartwarming to see a local publisher taking the initiative to support local authors by providing a space for their voice to be heard and their talent to be appreciated. This step forward may encourage more people to pick up a book to read while chilling and café-hopping.